Learn to identify your aura. An energy field surrounds every living thing, but not everyone knows how to see or decipher an aura. Follow this guide to identify and learn more about your aura. Auras are unique to an individual, so yours won’t be identical to your friends or loved ones. Since your aura frequently intermingles with those around you, though, it greatly affects both your relationships and your daily interactions with strangers. Though your aura doesn’t need to match someone else’s in order for the two of you to get along, it does mean that auras with similar frequencies lead to better relationships, as a love psychic can tell you. First, try visualizing your aura using your sense of sight. Position yourself in front of a mirror with a white or neutral background behind you, to eliminate distractions. Focus on your forehead for about a minute, and let your eyes relax. You’ll begin to see the impression of a halo around your head, starting as a soft white light. Keep your focus in the same area, and you’ll soon see a color. After focusing for an extended period of time, though, beware of afterimages, which appear as a negative of the actual color of your aura. Though you can certainly use your basic senses to see an aura, you may have better luck sensing it through intuition. To do this, you’ll want to get a better feel of your own energy. Make yourself comfortable, and hold your palms flat, about six inches from your head. Slowly move your palms down the length of your body, always keeping about six inches away. Allow yourself to feel your own energy and take care to sense the color. Auras typically manifest themselves in one of many colors of the rainbow. Depending on the hue, they can reveal much about you. Following are typical characteristics of individuals with certain auras. Pink: signals a loving, caring person who tends toward the romantic. 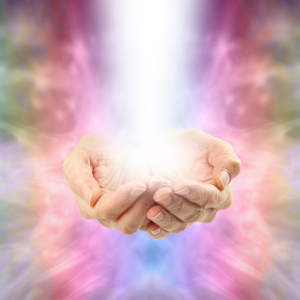 People with pink auras are typically welcoming hosts who love to surround themselves with people. Red: signals an energetic, adventurous, and possibly fiery personality. Most people with red auras are competitive and straightforward. Orange: signals a generous and empathetic person with advanced social skills. People with orange auras are often both sensitive and charming. Yellow: signals an analytical, logical person who tends to work hard and remain motivated. Some people with yellow auras might be considered eccentric in their interests. Green: signals a creative yet realistic person who is typically popular and highly respected. Many people with green auras are also motivated and hardworking. Blue: signals an eloquent, gregarious person who excels at communication. People with blue auras are great at inspiring others to take action or join movements. Purple: signals a thoughtful, philosophical person with advanced intuition. People with purple auras sometimes appear mysterious. Gold: signals an independent yet lavish person. People with gold auras are natural entertainers who thrive on admiration. Once you’ve identified your aura, you can start to identify the auras of others. Talk with a phone psychic to better understand why you’re attracted to some people and put off by others, based solely on their energy.